I’ve just woken up from a daytime nap after feeling like a wrung-out dishrag, and it’s time to get into the field and plant beans. But not before I take some minutes to write about how I got so tired. 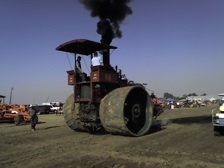 We were up at 6am to attend the Best Show on Tracks, which had been billed for weeks as being an antique tractor show. Well, I cam away stunned at having been privileged to see a slice of our American history that may have been a once in a lifetime opportunity. To my mind, the chief reason for the success of this event were the scores of old-timers, men in their mid-seventies and well beyond, that were out there in the hundred-degree weather taking the time to operate their machines, talk with visitors, and share their past. This photo shows a horse-drawn grain harvester, a very similar version of which was operated when one farmer was a youngster. By the age of 13, he was a crew foreman. 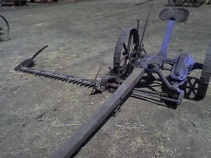 One day he was trying to adjust the cutting height of the implement while in operation, and a metal lever broke. His momentum sent him headlong. He fell and managed to catch one arm around part of the horses’ harness. He paddled for dear life as he dragged on the ground, desperately trying to keep away from the cutting blades right behind him. He "only" lost part of a finger and cut his arms before he rescued himself. He went on to tell that he hitched one horse to the wheel of the harvester, and rode the other home to find help. His father berated him mightily for getting hurt, and not being out in the field working. It didn’t take long to get the point that everything these men did in the field was hard, brutal work in the hot sun. Farming isn’t easy even now, but what I’m doing now would be a Sunday picnic to the life these people knew and lived. Another much more publicized happening at the show was the 80 year-old muleskinner driving a 27-mule team, with 1905 harvester through the wheat field right in front of all of us, showing how it was done more than a hundred years ago. The effort involved just getting the mules hitched up was mind-boggling. I defy anyone to have watched this spectacle (there’s no other suitable word) and not have to pause and think about what it took to raise food back then. To see the mule team coming down the row, all 27 animals making their turn around the corner while this behemoth of a wooden and metal machine plugged along….there just aren’t words. People who owned and restored the hundreds of pieces of equipment came from as far as Canada, at their own expense, to make this event happen. To see the machines working– the steam donkeys chugging away, the horse teams pulling the ride-on plow through the field, to climb all over a grain harvester created in nearby College City with my farming partner detailing every aspect of how to operate it for maximum yields, truly made for a great day. Admission for three; $30. Food and drink; about $50. Learning experience and memories…..you get the idea.